There are 47 ICOs opening a presale or a crowdsale this week, according to ICO market data from Token Report. To help sift through them, I created a list of seven questions every investor should ask when researching ICOs and tokens. Sadly, there’s only one project this week that makes it much past the first one or two of these, in my view. Bee Token (/BEE) is a decentralized Airbnb project, based in the San Francisco Bay Area, offering tokenized short-term rentals–an airbnb on the blockchain, without a middleman. It’s one of a handful of travel industry token projects that includes Lockchain, PocketInns and Winding Tree. Atlant is another, focused on tokenized real estate ownership and peer-to-peer rentals. It raised USD 6.7 million in an October ICO. Rentberry, a long-term rental token, is close to its USD 30 million hard cap, according to its website. Here’s how Bee Token measures up to my four momentum questions and three value questions. Please don’t take this as investment advice, but if my opinions help you form a more informed opinion of this project and of crypto in general, I’m glad to be of service. If you’d like to get our weekly picks and list of ICOs, subscribe to the Token Report newsletter. Who are the token issuers marketing to? Bee Token is marketing to an investor, not a user. “Read our whitepaper” and “join our Telegram chat” are two out of the three calls to action. (The other is for a newslettter.) Telegram is not where vacation rental owners hang out. BEE has done a great job capturing the interest of the cryptocurrency community, but done little to show they can market effectively to vacationers and homeowners. That makes BEE a short-term momentum investment, for now. Is the core team credible? Bee Token’s core team inspires some confidence: Co-founders hail from Uber, Facebook, Google and Civic–though most are fairly junior and this is the first time as CEO for Jonathan Chou, whose last role was as an engineer. There’s gender diversity in the team, which is a plus for me. All-male teams shouldn’t be a deal-breaker, but they do signal carelessness, which makes me scrutinize more closely. Is the network gaining momentum? Bee Token’s Telegram group is a (cough) hive of activity, but substantive posts are few and far between–and rarely generate threaded conversations. Some users complain of being blocked for earnest questions. Most of the subject matter is a torrent of questions posed by people who clearly didn’t take the time to read the pinned message. It’s little wonder that scammers have successfully targeted this population with phishing attacks, referenced frequently in the forum. What are the terms of the issuance? Bee Token is raising USD 5 million in its crowdsale, after raising USD 10 million in a two-phase presale. The contribution limit looks like it will be tight. So, yes, there are likely to be a lot of people who didn’t get into this, who would like to–and people who did get in, who would like to get more. 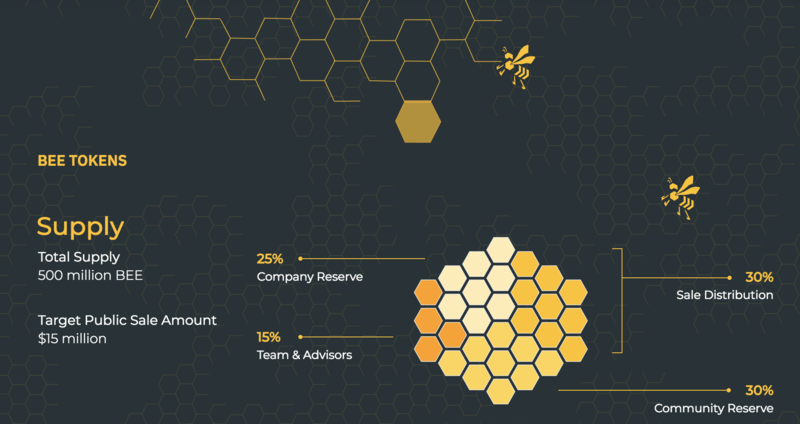 However, Bee Token also offered generous bonuses to its presale buyers. Their lock-up period for bonus tokens is only a month. Look out for a dump, but I don’t expect that to negatively affect the price over the next three to six months. Is there value underlying the speculation in the token? Bee Token’s unique selling point to homeowners and renters is, no fees, more earnings. They also emphasize protection against fraud, security of your personal data, and the opportunity to participate in cryptocurrency. I’m not sure the last three items will motivate mass adoption, but the first one could–especially if airbnb stumbles, providing an opening similar to the opening Uber has allowed Lyft with its missteps. Bee Token has provided little in the way of an open-source repository or a prototype that would aid in evaluating its offering. What does the token do that cash, or another cryptocurrency, cannot? Bee Token has thought through staking mechanisms that are likely to put a hold on velocity in the network. The mechanics are similar to those used in BitBay, an early decentralized ebay project. However, they are unlikely to overcome the volatility problem. Bee Token envisions a marketplace in which users pay each other in /BEE. It seems unlikely that a volatile new currency will be suitable for pricing rental listings and payments. Bee Token acknowledges this with a design that allows payments in fiat, /BTC or /ETH, for a fee. If transactions in BEE support the value of the token, as Bee Token claims, I’d be worried that most users will opt for fiat or a more liquid cryptocurrency. Who are the competitors? Lockchain (/LOC), a project out of Bulgaria, has a head start of a few months on Bee Token. They raised USD 4.2 million in a December ICO, according to Token Report data. There is also a competitor with an ICO that is live right now: PocketInns (/PINNS) has a credible team, a diligent effort and is open to US investors, but they are not showing signs of network momentum that would make them a credible threat to Bee Token. The obvious incumbent is airbnb. Eventually, as we all know, everything will be decentralized and tokenized. Until then, “decentralized” is compelling only to a niche customer. Bee Token is going to have to be very clever to come up with a marketing message that conveys value to the airbnb customer, or risk being too early. Think I got this one wrong? Does Lockchain have this market locked? Will Airbnb crush Bee Token like an insect? Is this going to be the biggest dump of the year? Get at me in the Token Report Telegram group, http://t.me/tokenreport, or in the comments here. Token Report is an independent financial information service founded by Galen Moore and Peter Vessenes. Blockchain News is an affiliated news site. Nothing contained in Token Report materials or posted at tokenreport.com constitutes an offer or a solicitation of an offer to buy or sell a security, financial instrument, or other category of asset, or investment advice or recommendation of a security, financial instrument or other category of asset. Tokens involve risk and are not suitable assets for everyone. Token Report believes its information was obtained from reliable sources but does not guarantee its accuracy or completeness and accepts no liability for losses arising from the publishing of this information. The information provided by Token Report is not a substitute for financial, legal and other professional advice. Each individual should always consult his or her own financial, legal or other professional advisors and discuss the facts and circumstances that apply to the individual.